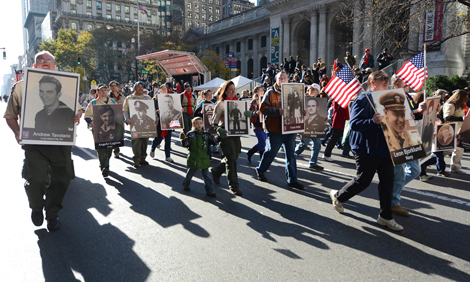 Marchers in a New York City Veterans Day parade held American flags and large, poster-sized images of men and women who had served in the U.S. military. Veterans Day is observed on November 11 each year to honor all veterans of the United States armed forces. A veteran is any former member of the armed forces. Veterans Day was originally called Armistice Day. It was named for the armistice, or peace agreement, that ended World War I on November 11, 1918. This holiday was first observed in 1919 and is dedicated to world peace. It is also a day to thank all veterans for their patriotism and service. After World War II and the Korean War, Americans believed that the name of the holiday should be changed to honor all veterans from all wars. In 1954, President Dwight D. Eisenhower changed the name of Armistice Day to Veterans Day. On Veterans Day, Americans take time to think about all the veterans, living and dead, who served the United States. They celebrate with parades and speeches that honor the service that members of the military have given their country. Why was Armistice Day changed to Veterans Day?